As is stands right now in the strength and conditioning industry, there isn’t a whole lot of quality information out there regarding youth training recommendations to get your kid off to a great start in his/her athletic career. Remember, I said quality information… not just information. There are plenty of power skating schools and part-time trainers currently working with kids who i’m sure have nothing but great intentions, but are unfortunately missing the mark when it comes to optimizing youth athletic development and future nervous system capability. First of foremost, yes, youth athletes can and should be training to optimize their future athletic career. But, the training stimulus isn’t identical to what adults should be exposed to. Meaning, don’t have your kid perform 7 sets of 3 of band resisted deadlifts at 90% of their 1-rep max as a part of their training session (something you might see in an NHL players training program). Any and all advanced techniques are to be kept for an older age when they will actually provide benefit. Why do we hold out on those? Why not use the fancy stuff now? Because a kid is a kid! The advanced methods are used once you are approaching your genetic potential and progress is coming at a much slower pace and you need new motor unit stimuli to get over a current plateau in a development. Kids are blank canvas’s, they can make a ton of progress for a long time with just the basics. 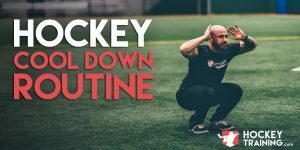 Not to mention advanced techniques for any type of resistance training, mobility, or conditioning can be just as mentally taxing as they are physically and can really bring the fun out of training with your youth. That is the worst thing that can happen. The last thing you want them to do is to lose interest in athletic development – if it’s not fun, it’s not going to last. I can guarantee you that. One of the biggest reasons there is a current lack in the industry for youth training fundamentals is simply because everybody wants to know how the pro’s train. They want to know; what is Sidney Crosby doing? When ironically, proper development through youth-specific training (and not when you are already an adult) is arguably the most important factor in long-term athletic success. Up until an athlete hits puberty (on average), it is during this time his/her nervous system is being molded like clay and has the most amount of trainability. Athletic ability is highly nervous system dependent through many different avenues that include total body relative strength, stride frequency, agility, balance, and body awareness. This is all heavily nervous system influenced. In a nutshell, the more movement exposure you receive in these crucial years, the more of an advantage you are going to have in all of the above qualities. Movement exposure refers to running, playing, crawling, multiple sports (hint: don’t specialize in hockey too young), resistance training, running backward… basically anything and everything movement related. The more unique movement skills learned, the better. This directly translates into a greater athletic ability not just acutely, but in the long term as well due to proper nervous system development. Should Young Hockey Players Focus Only on Hockey? To address the above hint, one of the biggest pieces of advice I could offer coaches and parents is to not specialize too early with their kids and/or youth athletes. The above traits I mentioned related to central nervous system capability are much, much harder to train in and out of the gym at a later age in life. This is why a minimalists approach to specialization is the best recommendation for future specialization. For example, if you took two kids and made one focus and play hockey year-round every year versus another kid who played hockey during the winter but then played baseball in the spring, soccer in the summer and lacrosse in the fall he is going to be the better hockey player when the time comes for his adolescence and adult years. Sure he played less hockey, but his nervous system exposure and overall athletic development before puberty was extremely superior to the first kid who only focused on hockey — and therefore, he created a much better skill-set within stride frequency (huge for speed), body awareness, total body relative strength, balance and agility. Not to mention the kid with greater exposure to sports would have far less susceptibility to creating any repetitive strain injuries or structural imbalances from constantly doing the same movement patterns. It’s not a mistake why you see young athletes with knee injuries these days that you would only ever see in an adult before, it’s because the parents are making the kids play hockey and attend power skating schools year-round. Repetition causes inflammation, inflammation leads to disruptions in technique, and disruptions in technique lead to injury. If you’re comparing the athletic ability of a youth athlete in multi-sports in comparison to a youth athlete focused only on hockey you will see a night and day difference from a sports performance and physiology perspective. Am I saying only ever do hockey during the winter? Especially if the kid absolutely loves hockey and wants to play it other times as well. #1: More coaches get more eyes on him. If he/she has different coaching throughout the summer and winter they may pick up areas in which they need to work on their game to reach a higher level. The more opinions, the better. This is especially true if your kid is enrolled in a hockey development school throughout the summer. #2: No exposure “drought”. If your kid goes through a 2-4 month drought with zero ice time and then is expected to hit the ice for tryouts come this fall he/she will be at a greater disadvantage compared to those who had exposure to the game throughout the summer. In my opinion, just jumping on the ice for a public skate isn’t enough, you want your youth athlete doing skill work and/or scrimmaging once a week or once bi-weekly prior to tryout time. Now stepping away from the power skating and bringing about a point I see with youth athletic training; pre-determined movement patterns have minimal carryover to sports performance. Meaning, if you are running around three cones for agility you’re really not training agility. Because the movement pattern is pre-determined. You already know exactly where you’re going and what you’re going to do about it. A game situation is never like that. Not to mention agility is the transfer of absorbing and re-directing force, a quality much more complex then cone drills. I go over this in much greater detail in our Hockey Agility Guide. To add some practical advice to agility, a kid would both get greater agility development and flat out have a way better time playing tag or playing dodgeball with the other kids. Tag and dodgeball are both completely unpredictable (already beats the cones), more physically demanding, and way more fun. If you want kids to have some better agility, play a little game at the end of the training session or practice. In fact, I would go as far as to say I think it is unsafe if they don’t strength train! Don’t get strength training confused with what you see on TV and on magazines. Strength training for youth does not mean deadlifting, Olympic lifting, squatting or moving any kinds of heavy loads and listening to Metallica. Strength training simply means training with a form of resistance to create a positive (and healthy) adaption in the body. I can’t understand at all when parents will throw their kid into martial arts, football, hockey, or wrestling –and then start to think twice when it comes to resistance training. That’s a completely flawed thinking process, but the myths have been around so long that it’s pretty standard these days for parents to worry about their kid if he/she decides to do a little training. Safely training with resistance is not only going to make your kids better athletes, but it should also give more peace of mind to the parents of the youth kid partaking in strength training. Strength training will drastically decrease the kids’ risk of injury out on the ice — and no, it’s not going to stunt his/her growth. Additionally, resistance training movements will pay great dividends to the nervous system development we have been talking about during these stages of life as well. I said right out in the first couple lines of this article — don’t have your kid perform high-intensity work. Opting for an overall lower intensity training periodization and program design is the smartest and best way to approach this thing. When training youth, resistance training should primarily come in the form of bodyweight exercises. 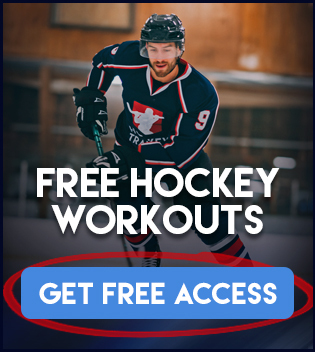 We have a full bodyweight hockey training program, great for kids! Always keeping the intensity low with rep ranges anywhere from 10-30 per exercise while keeping a close eye on proper technique. From a non-bodyweight perspective, youth athletes can also safely use light dumbbells, medicine balls, and light sled drags. What you want to stay away from is directly loading the spine; barbell squats, barbell overhead press, etc. It’s also wise to stay away from barbell movements in general, it’s unnecessary at this point in time and to be introduced in adolescence or only to a youth athlete who already has plenty of resistance training experience and is ready for the next step in progression. From a conditioning perspective, youth athletes can make great progress with both aerobic and anaerobic work. But for the anaerobic work, opt for no resisted loading (weighted vests, parachutes, ankle weights, etc). Conditioning systems utilizing hill sprints and/or track work is ideal here. Last but not least, some of my regular followers I’m sure saw this coming, but one of the absolute best things you can do for your kid’s overall health and athletic development is to not feed him/her a poor diet! The modern-day youth diet is the worst it has ever been in history and is completely full of sugar. They go from juice boxes, to pop, to fruit snacks, to chocolate, to chocolate milk, to breakfast cereal, to ice cream, fast food, etc. Parents more often than not just give in to the kids and give them whatever they want but the saying holds true, you are what you eat. These sugar high and lows are accompanied by high/low mood swings and high/low attention spans and focus. If a kid has sugar for breakfast and then 90 minutes later is sugar crashing during school or during hockey practice, his ability to stay focused and attentive is going to be lackluster. This is in addition to the physical effect that sugar crash is going to have on his performance. This means poorer focus at school, and reduced performance at hockey. Not exactly the best combination if you ask me. Am I saying kids have to eat like pro athletes? Of course not. That’s completely unrealistic and is not going to happen. But what is realistic and what should more often than not happen is to at least change some things. More proteins and more healthy fats in a kid’s diet will take them a long way with both their in-school attention and their athletic performance/body composition. That wraps up this hockey training for kids article. I hope it was helpful and has pointed you in the right direction of what actually improves performance vs. what is not worth doing with youth hockey players. If you’re ready for a full youth hockey training program you can click here to get signed up! • Youth athletes shouldn’t specialize in hockey year round. • Strength training is totally safe when done properly. • Low-intensity training should be favored. • One of the best things you can do for your kid’s performance is to improve their diet. • The more variety in sport and movement exposure you can get at a younger age, the better. Ready to help your child take their hockey game to the next level? Check out our Youth Hockey Training Program. Thanks for the info, this is all great. Just curious, after watching your YouTube video about in season training, nutrition, etc., I was wondering if you were going to make a youth program for the season. Thanks again! Currently we don’t plan on it, but maybe we can release a blog post talking about the in-season for youth athletes. I was wondering if playground play ( i.e : slides, ladders, monkeybars, etc ) would be considered resistance training ? Yes, monkey bars and ladders would be considered resistance training (slides wouldn’t be though)!